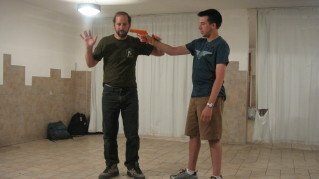 In Krav Maga we believe in reality training, we believe you should be prepared, but how? We all want to be prepared for the worst; we all want to be able to handle ourselves in challenging situations, we all wonder; "How will I react in a real life violent encounter?" We resolve to "Be Prepared", but how? How can we prepare ourselves for the worst? Well, this is what Krav Maga is about, preparing for the worst. Would you be calm in this situation? Many of us, by our nature, look for short cuts. I guess I am lucky that I have never been that way. When I met with my course counselor in Bernard Baruch graduate school, New York, to discuss my course load, she asked if I had taken calculus, and several other 'core' courses that are required for my degree. Foolishly, some might argue, I replied, "Yes, I have taken most of these courses but it has been a long time and if I am to truly understand my course of study (Business) I think I should retake all these courses." In the martial arts, in self defense, some people want shortcuts. Buy a DVD, attend a quick course, take a test and you're good to go, but not really. You still have to put in the time on the mat, a lot of time. Whether it is a dojo or an online course you will have to find a training partner and get sweaty. You will have to pay your dues on the training mat. Years ago a friend heard a sound in the middle of the night. He did not go into panic mode, he did not freeze. He remained calm, got up slowly and quietly, and investigated. Make a long story short the family of the burglar sued the home owner for severe damages inflicted upon him. The burglar was badly hurt and was no longer able to "work in his chosen profession." Now this Tel Aviv home owner, a certain Mr. Cohen, was also a fifth degree black belt. Although he might not have trained for this specific scenario he was still prepared. Years of training, fighting, grappling, getting hit and choked had prepared him for the stress of this home invasion. Had he just quickly learned some techniques, memorized them, been tested on them and moved on, he would not have been able to handle this situation. There is no shortcut; you have to put in your time. Another Mr. Cohen, this one Mr. Arthur Cohen of New York, the "Streetwise Professor", told me a different story. One of his students came in for a lesson; Professor Cohen spent the entire hour correcting the boys' technique. At the end of the lesson the boy says, "But I did not learn anything new today!" Our training is not about always learning 'new things' but about improving our 'old things' so we can actually use it when we need it. If you truly want to be prepared think in terms of real life, not in terms of belts and ranks and accumulated knowledge. To reach the state of calm reaction in a real life violent situation takes a long period of serious training, but it can be done, it is up to you. It is your attitude that will make a difference.